I've already missed two International Babywearing Weeks (2015 and 2016). I am so glad to finally be attending for the first time with my boys. We woke up early and commuted to Novaliches from Manila. 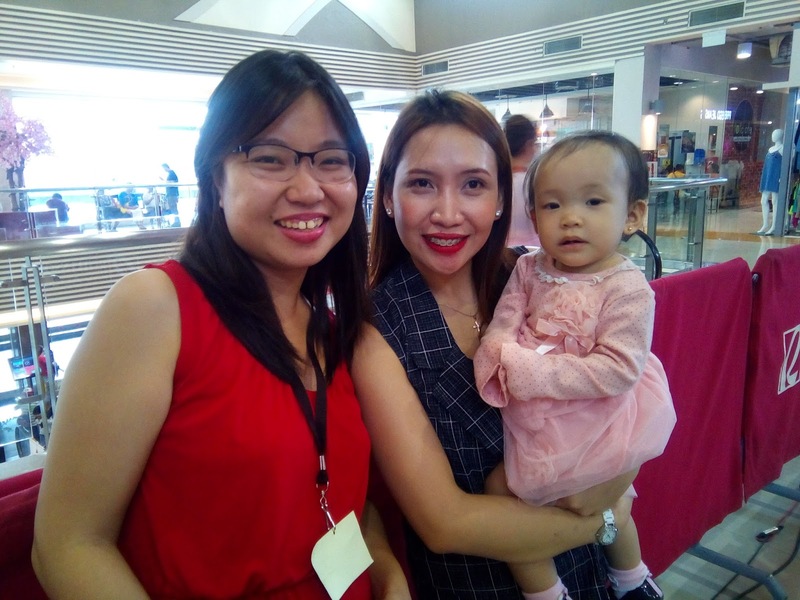 We met a couple of my BFP-Arugaan Breastfeeding Peer Counselors from Batch 5. Ms. Jen of Shadrach's Collection is actually my batchmate, as well as her sister Jinky. Leigh and Jenina were there, too. It was a mini reunion. It was so refreshing to see babywearing parents. Yes, parents! Even the daddies babywear, too. What was more amazing were the onlookers outside the event area who were watching all of us. Their faces read something like, "I'm gonna go tell my wife/husband/daughter/son to go babywear our kids/grandkids because it's so cool." 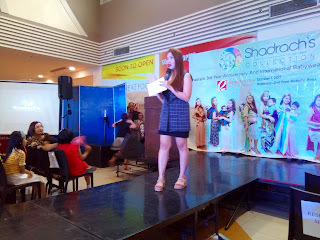 Ms. Jen also gave a heartwarming message on why and how she started Shadrach's Collection. From naming the business after her son to personally visiting weavers in Benguet and Batangas, here's a product, not only locally-made, but also a labor of love. This lovely mom of 4 is on a mission to help other moms do more while keeping our babies close. I gotta hand it to her. 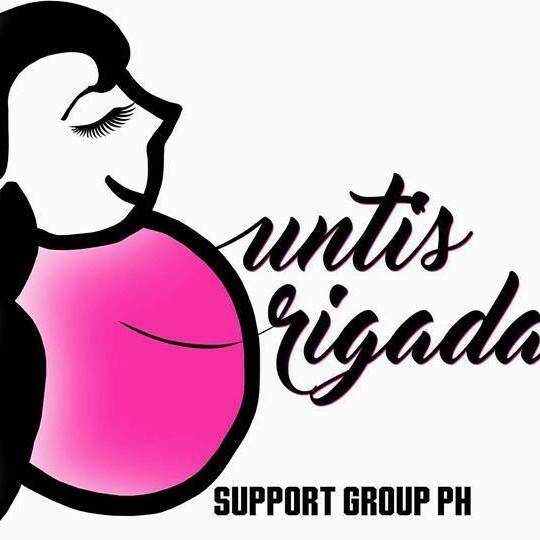 Though batchmates in the breastfeeding advocacy, I was closer to her sister. It was Jenina and Leigh who connected us. She was warm and welcoming, and you can immediately sense the humility despite being an entrepreneur. She was, in the simplest of words, kind. The event was packed with a lot of fun activities, informative talks, and sponsors' and mompreneurs' booths. 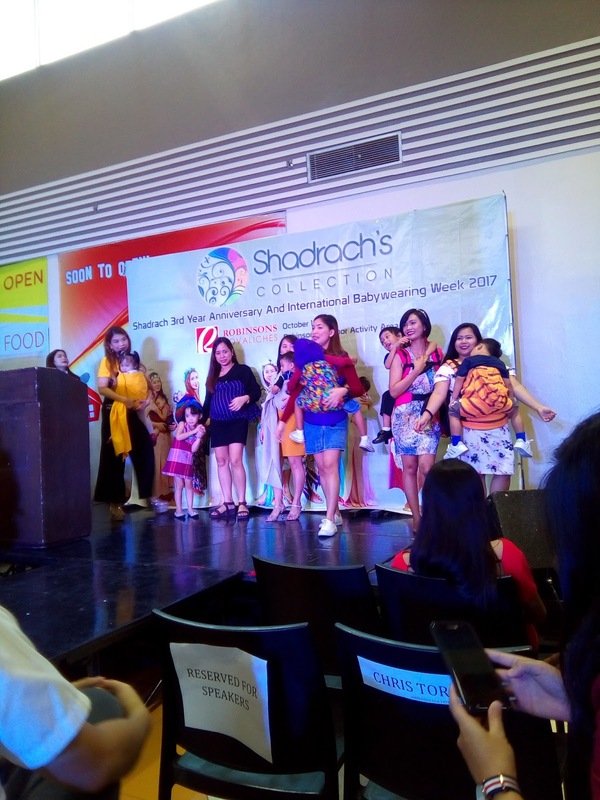 The fashion show featured moms, kids and daddies using wraps and slings. Not only that! We also got a sneak peek on Shadrach's Collection's upcoming new line of products for 2018. The polo for the little boys excited me! My breastfriends were frontliners! I'm a proud batchmate. 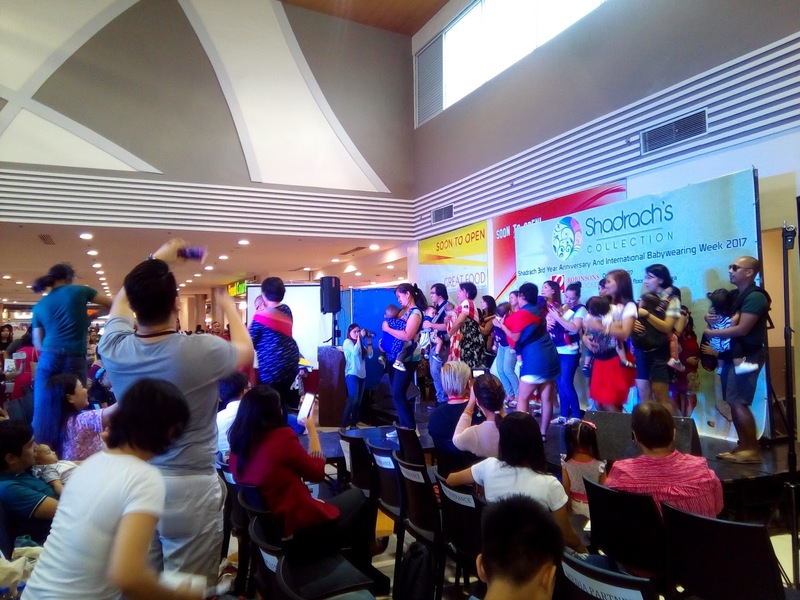 Part of the program was also a talk by Chris Torrance of Ambension Silk, a social enterprise located in the Gawad Kalinga Enchanted Farm at Angat, Bulacan which aims to revitalize the Philippine textile industry, particularly the Eri Silk. I didn't get to join the babywearing zumba because Popy slept during the two opportunities to do so. One of the sponsors, Tempra, did a brand presentation, too. They danced along Baby Shark! And I did a presentation, too! 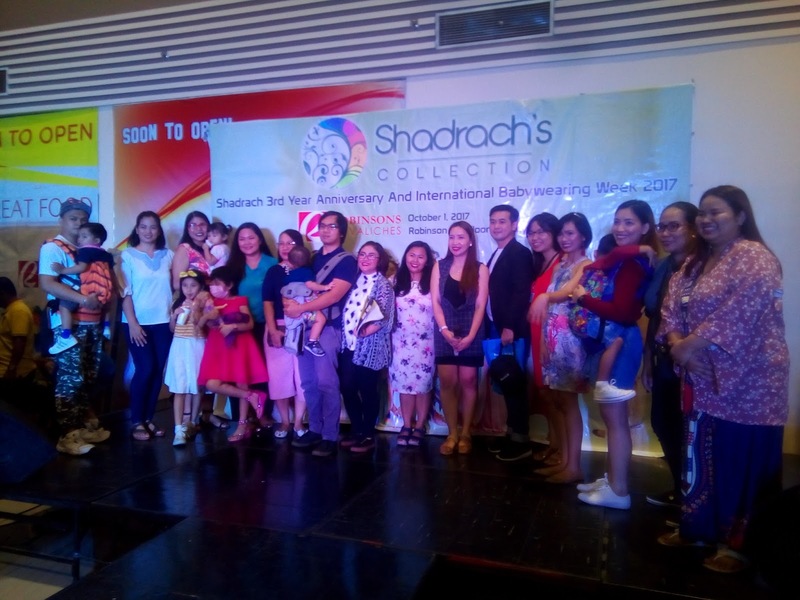 I was happy with my participation in Shadrach's Collection's celebration. 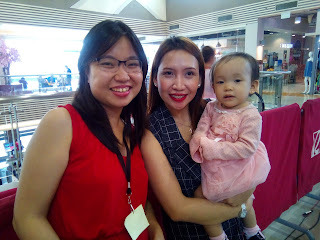 Apart from being a media partner with my blog Bare Nanay and a sponsor for the raffle as Posh/Mum, I also made a video testimony on how babywearing has helped me as a work-at-home mom. 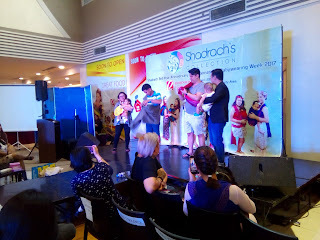 There was, of course, a babywearing talk and demo, by none other but babywearing expert, Ann Santos of Ann Pinay Babywearer. I've been following her since last year, after she offered her meitai for a holiday when I lost my one and only carrier. Her videos are my go-to for wrap tutorials back when I was just starting to use woven wraps. She was seated behind us, and I was so shy to say "hi", which wasn't even normal by my standards. Me? Shy? C'mon! So I sent her a private message, instead. Must. Gather. Courage. To. Talk. Next. Time. While. Fan-girling. 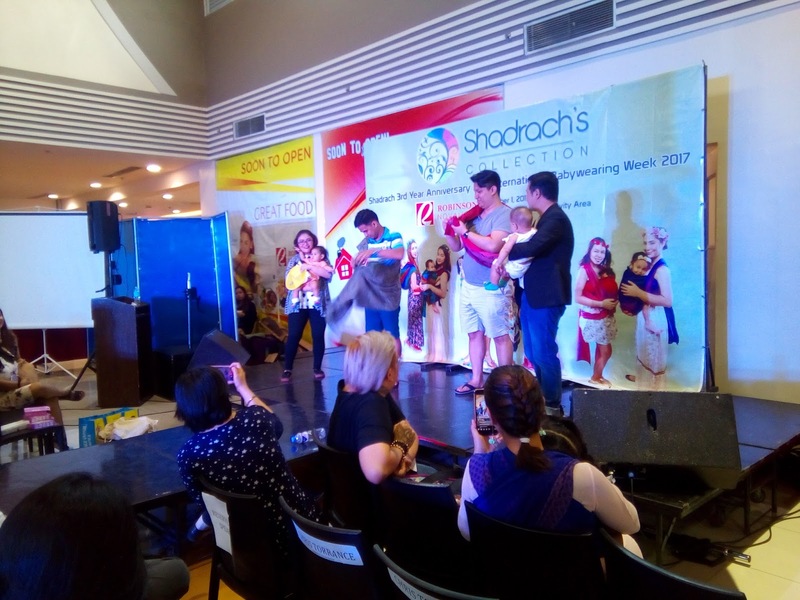 After a quick ring-sling competition between two daddies where the first-timer did really well, my co-breastfeeding peer counselor and co-admom, Keiko, discussed breastfeeding to all our mommies and daddies in the audience. Thet of Dream Bites also shared her milk-boosting supply, and lastly a talk on mutual fund investment. Look at those babywearing dadas slaying those ring sling. I don't even know how to use that. I'm hoping we could celebrate this again next year. Maybe we can make it an annual thing for Shadrach's, eh? I'd gladly travel all the way from Quezon for this. Keep them close and carry them with love! Shadrach's Collection's Jen Alegarbez with the organizing team, hosts, sponsors and speakers.